^ Lassa, Todd. The Beginning of the End of Driving. Motor Trend. January 2013 [1 September 2014]. ^ U.S. Department of Transportation Releases Policy on Automated Vehicle Development. National Highway Traffic Safety Administration. 2013-05-30 [2015-09-27]. ^ AdaptIVe system classification and glossary on Automated driving (PDF). ^ 'Phantom Auto' will tour city. The Milwaukee Sentinel. Google News Archive. 8 December 1926 [23 July 2013]. ^ Carnegie Mellon. Navlab: The Carnegie Mellon University Navigation Laboratory. The Robotics Institute. [2014-12-20]. ^ Kanade, Takeo. Autonomous land vehicle project at CMU. CSC '86 Proceedings of the 1986 ACM fourteenth annual conference on Computer science. February 1986. doi:10.1145/324634.325197. ^ Wallace, Richard. First results in robot road-following (PDF). JCAI'85 Proceedings of the 9th international joint conference on Artificial intelligence. 1985. （原始内容 (PDF)存档于2014年8月6日）. ^ 9.0 9.1 Schmidhuber, Jürgen. Prof. Schmidhuber's highlights of robot car history. 2009 [15 July 2011]. ^ Video Friday: Bosch and Cars, ROVs and Whales, and Kuka Arms and Chainsaws. IEEE Spectrum. 25 January 2013 [26 February 2013]. ^ Audi of America > news > Pool > Reaffirmed Mission for Autonomous Audi TTS Pikes Peak. AudiUSA.com. [28 April 2012]. （原始内容存档于2012年7月10日）. ^ Nissan car drives and parks itself at Ceatec. BBC. 4 October 2012 [4 January 2013]. ^ Toyota sneak previews self-drive car ahead of tech show. BBC. 4 January 2013 [4 January 2013]. ^ Doing the school run just got easier! Nissan unveils new car that can drive itself on short journeys. Daily Mail (London). 14 February 2013 [14 February 2013]. ^ Google's Self-Driving Cars: 300,000 Miles Logged, Not a Single Accident Under Computer Control. The Atlantic. [10 August 2012]. ^ Vislab, University of Parma, Italy - 8000 miles driverless test begins. [27 October 2013]. （原始内容存档于2013年11月14日）. ^ VisLab Intercontinental Autonomous Challenge: Inaugural Ceremony – Milan, Italy. [27 October 2013]. ^ Vislab, University of Parma, Italy - Public Road Urban Driverless-Car Test 2013 - World premiere of BRAiVE. ^ Muller, Joann. "With Driverless Cars, Once Again It Is California Leading The Way". Forbes. 26 September 2012. Retrieved 12 March 2013. ^ 20.0 20.1 Nevada enacts law authorizing autonomous (driverless) vehicles. Green Car Congress. 25 June 2011 [25 June 2011]. ^ 21.0 21.1 Alex Knapp. Nevada Passes Law Authorizing Driverless Cars. Forbes. 22 June 2011 [25 June 2011]. （原始内容存档于2011年6月28日）. ^ 22.0 22.1 22.2 John Markoff. Google Lobbies Nevada To Allow Self-Driving Cars. The New York Times. 10 May 2011 [11 May 2011]. ^ Autonomous Vehicles. State of Nevada Department of Motor Vehicles. [25 June 2013]. ^ Ramsey, John. Self-driving cars to be tested on Virginia highways. Richmond Times-Dispatch. 1 June 2015 [4 June 2015]. ^ Why autonomous and self-driving cars are not the same. The Economist explains. The Economist Group. 1 July 2015. ^ 美国警方：初步调查表明交通事故责任不在Uber - 第一电动网. www.d1ev.com. [2018-03-20] （中文（中国大陆）‎）. ^ Driverless cars take to the road. E.U.CORDIS Research Program CitynetMobil. [27 October 2013]. ^ Snyder OKs self-driving vehicles on Michigan's roads. Detroit News. 27 December 2013 [1 January 2014]. ^ BBC News - UK to allow driverless cars on public roads in January. BBC News. [4 March 2015]. ^ Burn-Callander, Rebecca. This is the Lutz pod, the UK's first driverless car. Daily Telegraph. 11 February 2015 [11 February 2015]. ^ Miller, John. Self-Driving Car Technology's Benefits, Potential Risks, and Solutions. theenergycollective.com. 19 August 2014 [4 June 2015]. （原始内容存档于2015-05-08）. ^ Whitwam, Ryan. How Google’s self-driving cars detect and avoid obstacles. ExtremeTech. 8 September 2014 [4 June 2015]. ^ 35.0 35.1 35.2 Cowen, Tyler. Can I See Your License, Registration and C.P.U.?. The New York Times. 28 May 2011. ^ 37.0 37.1 Future Car Focus: Robot Cars. MSN Autos. 2013 [27 January 2013]. ^ Get ready for automated cars. Houston Chronicle. 11 September 2012 [5 December 2012]. ^ Changes to older driver licensing. ^ Woodyard, Chris. McKinsey study: Self-driving cars yield big benefits. USA Today. 5 March 2015 [4 June 2015]. ^ BMW Remote Controlled Parking. ^ Arth, Michael E. Democracy and the Common Wealth: Breaking the Stranglehold of the Special Interests.. Golden Apples Media. 2010: 363–368. ISBN 978-0-912467-12-2. Arth claims that this would be possible if almost all private cars requiring drivers, which are not in use and parked 90% of the time, would be traded for public self-driving taxis that would be in near-constant use. ^ 254. Koushik Dutta - Google+ - The Unintended Effects of Driverless Cars Google has been... Plus.google.com. [28 April 2012]. ^ 44.0 44.1 Light, Donald. A Scenario" The End of Auto Insurance. Celent. 8 May 2012. ^ Tsz-Chiu Au, Michael Quinlan, and Peter Stone. Setpoint Scheduling for Autonomous Vehicle Controllers. IEEE International Conference on Robotics and Automation. 2012. Retrieved 12 March 2013. ^ AIM: Autonomous Intersection Management - Project Home Page. Cs.utexas.edu. 21 February 2012 [28 April 2012]. ^ Autonomous Intersection Management - FCFS policy with 6 lanes in all directions. YouTube. 12 June 2009 [28 April 2012]. ^ Simonite, Tom. Data Shows Google’s Robot Cars Are Smoother, Safer Drivers Than You or I. MIT Technology Review. October 25, 2013 [15 November 2013]. ^ Miller, Owen. Robotic Cars and Their New Crime Paradigms. [4 September 2014]. ^ Gurney, Jeffrey K. Sue My Car Not Me: Products Liability and Accidents Involving Autonomous Vehicles. U. Ill. J.L. Tech. & Pol’y. 2013, 2013 (2): 247–277. ^ New Allstate Survey Shows Americans Think They Are Great Drivers - Habits Tell a Different Story. PR Newswire. 2 August 2011 [7 September 2013]. ^ David Shepardson. Study: Self-driving cars to jolt market by 2035. The Detroit News. 31 December 2013 [24 January 2014]. ^ Hackers find ways to hijack car computers and take control. 3 September 2013 [7 September 2013]. ^ Philip E. Ross. A Cloud-Connected Car Is a Hackable Car, Worries Microsoft. IEEE Spectrum. 11 April 2014 [23 April 2014]. ^ Driverless cars face cyber security, skills and safety challenges. [2015-04-24]. ^ Will Regulators Allow Self-Driving Cars In A Few Years?. Forbes. 24 September 2013 [5 January 2014]. ^ Reliance on autopilot is now the biggest threat to flight safety, study says. 18 November 2013 [19 November 2013]. ^ Mui, Chunka. Will The Google Car Force A Choice Between Lives And Jobs?. Forbes. 19 December 2013 [19 December 2013]. ^ Mass unemployment fears over Google artificial intelligence plans. London. 29 December 2013 [29 December 2013]. ^ Patrick Lin. What If Your Autonomous Car Keeps Routing You Past Krispy Kreme?. The Atlantic. 22 January 2014 [22 January 2014]. ^ 61.0 61.1 Glenn Garvin. Automakers say self-driving cars are on the horizon. Miami Herald. 21 March 2014 [22 March 2014]. ^ Mark Harris. FBI warns driverless cars could be used as 'lethal weapons'. theGuardian.com. 16 July 2014. ^ Patrick Lin. The Ethics of Autonomous Cars. The Atlantic. October 8, 2013. ^ Tim Worstall. When Should Your Driverless Car From Google Be Allowed To Kill You?. Forbes. 2014-06-18. ^ Alexander Skulmowski, Andreas Bunge, Kai Kaspar and Gordon Pipa. Forced-choice decision-making in modified trolley dilemma situations: a virtual reality and eye tracking study. Front. Behav. Neurosci. December 16, 2014. ^ 66.0 66.1 66.2 Gomes, Lee. Hidden Obstacles for Google’s Self-Driving Cars. MIT Technology Review. 28 August 2014 [22 January 2015]. ^ 67.0 67.1 67.2 Badger, Emily. 5 confounding questions that hold the key to the future of driverless cars. Wonk Blog (The Washington Post). 15 January 2015 [22 January 2015]. ^ How mobility innovations could re-shape our cities. Tea after Twelve. [September 2014]. ^ Lee, Timothy. Driverless cars will mean the end of mass car ownership. Vox. 31 January 2015 [31 January 2015]. ^ Bryant Walker Smith. Automated Vehicles Are Probably Legal in The United States. The Center for Internet and Society (CIS) at Stanford Law School. 1 November 2012 [31 January 2013]. ^ Bryant Walker Smith. 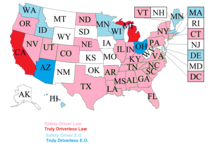 Automated Driving: Legislative and Regulatory Action. The Center for Internet and Society (CIS) at Stanford Law School. [31 January 2013]. ^ Christine Dobby. Nevada state law paves the way for driverless cars. Financial Post. 24 June 2011 [25 June 2011]. ^ Bill AB511 Nevada Legislature (PDF). Nevada Legislature. [25 June 2011]. ^ Tim Healey. Nevada Passes Law Allowing Self-Driving Cars. Motor Trend. 24 June 2011 [25 June 2011]. ^ Cy Ryan. Nevada issues Google first license for self-driving car. Las Vegas Sun. 7 May 2012 [12 May 2012]. ^ 76.0 76.1 UK to road test driverless cars. BBC. 16 July 2013 [17 July 2013]. ^ Des véhicules autonomes sur route ouverte à Bordeaux en octobre 2015. 2015-06-29 [2015-09-27]. ^ Swisscom reeals the first driverless car on Swiss roads. Swisscom. 12 May 2015 [1 August 2015]. （原始内容存档于2015年9月28日）. ^ Frequency of Target Crashes for IntelliDrive Safety Systems (PDF). National Highway Traffic Safety Administration. October 2010 [2015-09-27]. ^ No lights, no signs, no accidents - future intersections for driverless cars | Video. Reuters.com. [28 April 2012]. ^ Consumers in US and UK Frustrated with Intelligent Devices That Frequently Crash or Freeze, New Accenture Survey Finds. Accenture. 10 October 2011 [30 June 2013]. ^ Yvkoff, Liane. Many car buyers show interest in autonomous car tech. CNET. 27 April 2012 [30 June 2013]. ^ Autonomous Cars Found Trustworthy in Global Study. autosphere.ca. 22 May 2013 [6 September 2013]. ^ Autonomous cars: Bring 'em on, drivers say in Insurance.com survey. Insurance.com. 28 July 2014 [29 July 2014]. ^ Autonomous Vehicle Predictions: Auto Experts Offer Insights on the Future of Self-Driving Cars. PartCatalog.com. 16 March 2015 [18 March 2015]. ^ Kyriakidis, M., Happee, R., & De Winter, J. C. F. Public opinion on automated driving: Results of an international questionnaire among 5,000 respondents. Transportation Research Part F: Traffic Psychology and Behaviour. 2015: 127–140. doi:10.1016/j.trf.2015.04.014. ^ Mercedes-Benz to Introduce Autobahn Pilot Assistant in Two Years. Autoevolution. 11 November 2013 [20 October 2014]. ^ Mobileye Automated Driving. YouTube. Mobileye. 7 August 2014 [10 August 2014]. ^ Nawaguna, Elvina. U.S. may mandate 'talking' cars by early 2017. Reuters. 3 February 2014 [17 September 2014]. ^ Colias, Mike. GM plans to launch Cadillac CTS with vehicle-to-vehicle tech in 2 years. Automotive News. 7 September 2014 [17 September 2014]. ^ Self-driving Tesla expected within 3 years, Elon Musk says. CBCNews. 2015-06-10 [2015-09-27]. ^ Gara, Antoine. Israel's Mobileye Looks to Driverless Car after Record IPO. Yahoo Finance. 1 August 2014 [19 October 2014]. ^ Stephen Lawson. Cars will drive themselves in three phases: First, traffic jams. Computerworld. 3 March 2015 [2 March 2015]. ^ China Startup Races Tesla With Driverless Trucks in Arizona. Bloomberg.com. 2017-09-06 [2018-03-15] （英语）. ^ Autonomous Driving according to Volvo Car Group: benefits for society and consumers alike. Volvo News. 2 December 2013 [2 February 2014]. （原始内容存档于2015年9月28日）. ^ Volvo Cars Will Be Crash Free. Alternative Route. 2014-08-21 [2015-09-28]. （原始内容存档于2015-09-28）. ^ Preisinger, Irene. Daimler aims to launch self-driving car by 2020. Reuters. 8 September 2013 [14 September 2013]. ^ Elmer, Stephen. BMW Targets 2020 for Self-Driving Cars. AutoGuide. 26 February 2013 [17 April 2013]. ^ Johnson, Drew. Audi predicts self-driving cars by 2020. Left Lane News. 30 January 2013 [13 April 2013]. ^ Cheng, Roger. General Motors President sees self-driving cars by 2020. CNET. 25 March 2014 [25 March 2014]. ^ Eric, Mack. Elon Musk: Don't fall asleep at the wheel for another 5 years (10 October 2014). CNET. [12 October 2014]. ^ Rogers, Christina. Google Sees Self-Drive Car on Road Within Five Years. Nasdaq. January 14, 2015 [February 7, 2015]. ^ Google car project finds friends in industry. Autonews. 19 January 2015 [20 February 2015]. ^ Google Talking to Auto Makers About Self-Driving Car. Wall Street Journal. 13 May 2014 [20 February 2015]. ^ Jonathan Hawley. Jaguar joins the race to driverless cars. drive.com.au. 3 October 2014 [3 October 2014]. ^ David Shepardson. Daimler chief: Fully autonomous vehicles could be ready by 2025. Detroit News Washington Bureau. 13 January 2014 [14 January 2014]. （原始内容存档于2014-01-16）. ^ INSIDE AUTO: Ford, researchers to work on autonomous cars. The News-Herald. 28 January 2014 [28 January 2014]. ^ Mike Ramsey and Geoffrey Fowler. Ford Chief Says Mass-Market Autonomous Vehicle Is Priority. Wall Street Journal. 7 January 2015 [7 February 2015]. ^ Matthew Rocco. Self-Driving Cadillac Brings Industry Closer to Autonomous Car. Fox Business. 8 September 2014 [30 September 2014]. （原始内容存档于2014-10-05）. ^ Chuck Tannert. Will You Ever Be Able To Afford A Self-Driving Car?. Fast Company. 31 January 2014 [1 February 2014]. ^ Autonomous Vehicles Will Surpass 95 Million in Annual Sales by 2035. navigantresearch.com. 21 August 2013 [6 September 2013]. （原始内容存档于2015-09-28）. ^ Look Ma, No Hands!. ieee.org. 2 September 2012 [6 September 2013]. ^ Gomes, Lee. Driving in Circles 3.9k 437 480 The autonomous Google car may never actually happen.. Slate. 21 October 2014 [21 January 2015]. ^ TRANSFORMING+PERSONAL MOBILITY (PDF). The Earth Institute, Columbia University. 27 January 2013 [6 September 2013]. ^ Look Mom, No Hands! (PDF). emarketing.pwc.com. February 2013 [6 September 2013]. （原始内容 (PDF)存档于2013年9月3日）. ^ Self-driving cars: The next revolution (PDF). kpmg.com. 5 September 2013 [6 September 2013]. ^ [INFOGRAPHIC] Autonomous Cars Could Save The US $1.3 Trillion Dollars A Year. businessinsider.com. 12 September 2014 [3 October 2014]. O'Toole, Randal. Gridlock: why we're stuck in traffic and what to do about it. Cato Institute. 2009. ISBN 978-1-935308-23-2. Wayner, Peter. Future Ride: 80 Ways the Self-Driving, Autonomous Car Will Change Everything from Buying Groceries to Teen Romance to Surviving a Hurricane to Turning Ten to Having a Heart Attack to Building a Dream Home to Simply Getting From Here to There. CreateSpace. 2014. ISBN 978-1484123331. Meyer, Gereon, Beiker, Sven (Eds. ), Road Vehicle Automation. Springer 2014. Meyer, Gereon, Beiker, Sven (Eds. ), Road Vehicle Automation 2. Springer 2015. The Loadstar, The driving factors behind driverless trucks. 2015.